So you want to be a teacher – or maybe you’ve been at it for years. Either way, a gap year project involving teaching can do wonders for your personal and professional development. 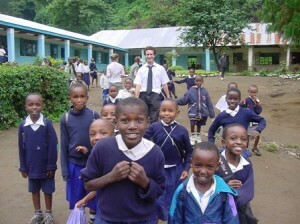 One of the most rewarding options is to do voluntary work at a school in the developing world. It is possible to teach most subjects, although schools will be particularly keen for help teaching English, as this can open up good job opportunities to children in the future. You don’t have to be a qualified TEFL teacher. The most important thing is that you have the character and imagination to help the class learn and practise things in a fun way. At Oyster we prepare you with plenty of ideas for approaching lessons, all summarised in a special manual. If you are considering going into teaching, this is the perfect introduction. You’ll be able to try out different approaches and see what works in a very forgiving environment (the children tend to think you are wonderful). Experience of a very different classroom. No interactive whiteboards, no computer room or TV. Instead it’s you, an old-fashioned blackboard and some good ideas. The pleasure of teaching kids who really want to be there. Kids in the developing world are well aware that an education will help them out of poverty. They are immensely cheerful too. You wouldn’t guess at the tough lives many of them lead – some will be aids orphans, some hungry. An insight into the difficulties of running a school with very few resources. At some of our schools, the pupils grow produce for school meals. Huge fun and satisfaction from providing extra-curricular opportunities after school. Our volunteers have taken the initiative and set up clubs for sport, music and drama. It’s a big deal for these kids and they love it. Needless to say, all this looks great on your CV too. Next Post Too young to take a gap year?